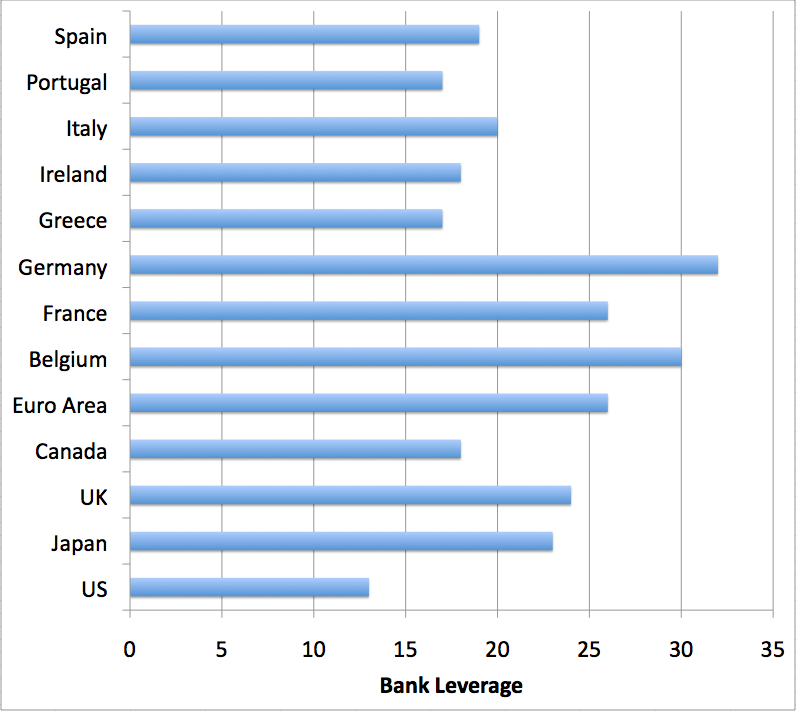 The graph above shows the leverage of private banks in various developed countries. The data come from the IMF Global Financial Stability Report of April 2011, Table 1.1. "Leverage is defined as tangible assets to tangible common equity for domestic banks." Running at high leverage means living dangerously. 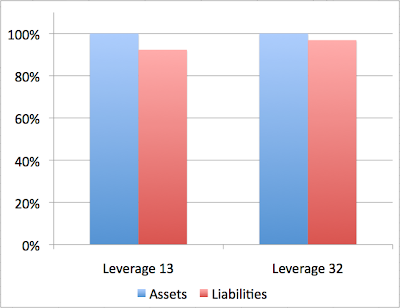 If something starts to go wrong with the bank's assets (let's say there's a recession, and some of the companies and households that owe them money default), then they only need to have their assets impaired by a few percent before the bank is insolvent. So anyway, the upshot is that euro area banks have been living very dangerously. 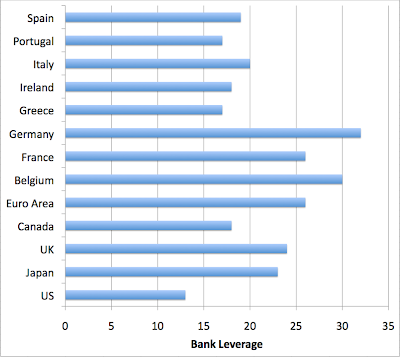 German, French, and Belgian banks all have much higher leverage than US banks (which presumably learnt their lesson in 2008). FRANKFURT (MNI) - The solution to the problems facing Greece should under no circumstances include any credit event or default, European Central Bank President Jean-Claude Trichet said in an interview released Thursday, reiterating the concern he has expressed repeatedly in recent weeks. Trichet told The Times of London that it is "not advisable" for authorities "to embark on a compulsory way of dealing with" the Greek issue. "We are telling them that doing anything that would create a credit event or selective default or default is not advisable," he emphasized. While making it clear that the decision rests with national governments of the Eurozone, Trichet also observed pointedly that once the decision has been made, the ECB "will take all the appropriate decisions ourselves as far as the Eurosystem is concerned, in line with our statutory obligations." "But again, we are saying very clearly that they should avoid compulsion, a credit event, or selective default or default. Our position is clear," he added, declining all further comment when asked about the possibility of a compromise. Senior ECB officials have warned recently that the central bank would not be able to accept Greek bonds as collateral in refinancing operations were they to be considered in default. This, they have noted, could lead to a virtual collapse of the Greek banking system. As to the idea of Greece, Ireland or Portugal withdrawing from the common currency, Trichet said it was "not a working assumption that anybody considers." He said that nobody in an official position had ever raised the possibility with him. Stone-throwing Greeks clashed with police and tens of thousands of protesters marched on parliament on Wednesday to oppose government efforts to pass new austerity measures for the debt-stricken euro zone state. Unions representing half the five-million-strong workforce also launched a nationwide strike, shutting ports, schools and other basic services in the Mediterranean state. Prime Minister George Papandreou must push through a new five-year campaign of tax hikes, spending cuts and sell-offs of state property to continue receiving aid from the European Union and International Monetary Fund and avoid default. He not only faces public protests and resistance from a conservative opposition that has surpassed his Socialist party in opinion polls, but a few backbenchers in his own parliamentary grouping are also threatening to reject the plan. Thanks, Stuart- that is very interesting. Apparently there is more than one way to abuse a common currency! I think anyone who's thinking about this stuff should read "This time is different: 8 centuries of financial folly". Greece has a spectactular history of serial default on sovereign debt. It also informs our intuition about economic recovery following a banking crisis: you can't expect the same kind of quick recovery as you might from a more benign recession. I never studied economics so I found this series of videos to be a bit of an eye opener : "Money As Debt - Fractional Reserve Banking". Just found this page showing country and individual bank exposure to Greece. The top two German banks have exposure of 27% and 21% of equity respectively. One of the reasons German banks had higher leverage is because they were busy recycling the German export surplus. In earlier times, when Saudi Arabia did it, this was called "recycling petrodollars"